In thinking about your attitude, are you choosing joy? Or are you wallowing in the woulda, coulda, shouldas of your life? Are you practicing Daily Defamations instead affirming and focusing on whats right with you instead of what you perceive as being wrong with you? Your success in business and in life is shaped by your concept of yourself. How you define yourself, how you present yourself is a manifestation of your inward thought  the choices you make, the actions you take, the decisions you make (or dont make!). To be successful in business, a company begins by creating three things: a Vision Statement, a Mission Statement, and an About Us Statement. To be successful in life, we need to take this same three-step approach in shaping the direction of our personal lives. 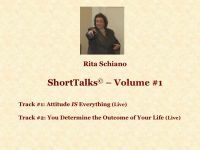 This ShortTalks© presentation takes you through the process of creating your personal Vision Statement, Mission Statement, and About You Statement.